The Riot Club is a 2014 British drama thriller film directed by Lone Scherfig and written by Laura Wade, based on Wade's 2010 play Posh. 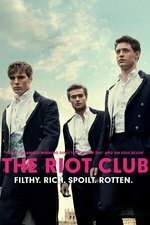 The film stars Max Irons, Sam Claflin and Douglas Booth.It is set among the Riot Club, a fictional all-male, exclusive dining club at Oxford University. When the play Posh premiered, the Riot Club was often described as a thinly veiled version of the real-life Bullingdon Club (or indeed the less well known High Trees Society of Reigate Grammar School),although according to Wade it is entirely fictitious. an exclusive but unofficial all-male students' dining club based in Oxford, United Kingdom. It is noted for its wealthy members, grand banquets and boisterous rituals, such as the vandalising ('trashing') of restaurants and college rooms. The Bullingdon was originally a sporting club, dedicated to cricket and horse-racing, although club dinners gradually became its principal activity. Membership in the club is expensive, with tailor-made uniforms, regular gourmet hospitality, and a tradition of on-the-spot payment for damages. Yeah, after seeing the recent political events I thought I would drag this out after remembering reading reviews and articles from when it came out. The consensus I remembered was it was pretty much a hateful film featuring hateful people doing hateful things. And that is pretty much the case. Probably it's greatest sin, as well as indifferent acting and direction, is that it does not differentiate it's characters sufficiently and you have a real hard time telling all the floppy-haired fops apart until well into the film - there's the slightly sympathetic one whose hearts not really in it who quickly gains a Northern Normal Girl gf, his main rival, two utter twits, the president of the club, the gay/academic one, the rich Greek one and some more you really can't tell apart. There were a lot of potential subplots but they were only really hinted out when they could have been so much more - like it was pretty obvious that the Greek guy was only in the club because of his wealth but this wasn't really explored beyond a couple of lines. There's an interesting story to tell here about these dining clubs and the influence of their members in the upper echelons of society but this does not really dig deep enough and despite all the mayhem not really nasty enough.